The seven young ladies of St Ethelreda's School are somewhat dysfunctional. Nevertheless, none of them is responsible for the murder of their headmistress and her odious brother. The girls are not eager to be separated and return to their families, so they concoct a plan to cover up the deaths. A plan which unravels with hilarious consequences. 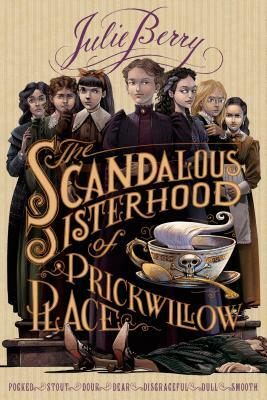 Julie Berry creates a Victorian whodunit with plenty of surprises, twists, slapstick, thwarted love and social niceties. The ensemble cast of characters is really brought to life, by their appropriate nicknames, such as Dour Elinor, Smooth Kitty and Disgraceful Mary Jane. The Scandalous Sisterhood is very silly and a lot of fun. Review first published in meetYA@DIESEL newsletter, September, 2014.